In 2781 the Star League was officially abandoned, ending a two hundred year-long Golden Age. In 2785 the Successor Lords launched a series of massive conflicts that would rage for centuries and become known as The Succession Wars. Such endless warfare has taken its toll and by the Fourth Succession War of 3028, the technology employed on the battlefields is a mere shadow of the height of the Star League. However, the discovery of the Helm Memory Core is beginning to unlock such sought-after secrets, with new BattleMechs and experimental technologies starting to make a debut for the first time in centuries. Classic BattleTech Technical Readout: 3039™ is the perfect “first Technical Readout” companion to the Classic BattleTech Introductory Box Set. 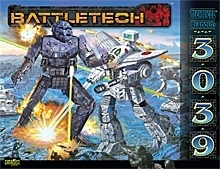 Combining the ’Mechs, vehicles and aerospace fighters previously found in Technical Readout: 3025, Revised and Technical Readout: 3026, Revised, this volume features some of the most common units of the Succession Wars. Each machine is illustrated in detail, accompanied by a description of its history, capabilities, game stats, along with their most famous pilots. This title was added to our catalog on September 15, 2010.